In this guide you will learn why most ICO’s Will Fail..
On June 12, 2017, an Ethereum based called Bancor held its ICO. It raised $153 million in 3 hours. No, you are not reading it wrong, 153 million…..in 3 hours!!! If that doesn’t get your brain melting, then how about this? The BAT ICO $35 million in 30 seconds!!! That’s near $1.2 million per second! And if that still doesn’t get your jaw dropping, then how about this? Have you heard of UET? UET had an ICO which raised $40,000 in just 3 days. Admirable if not particularly mind-blowing. Why do we bring it up after talking about Bancor and BAT? Well, UET stands for “Useless Ethereum Token”, it is a “joke coin”. Here is the sales pitch that they used, “UET is a standard ERC20 token, so you can hold it and transfer it. Other than that… nothing. Absolutely nothing.” And they raised $40,000 in 3 days! Welcome to the crazy world of ICOs! 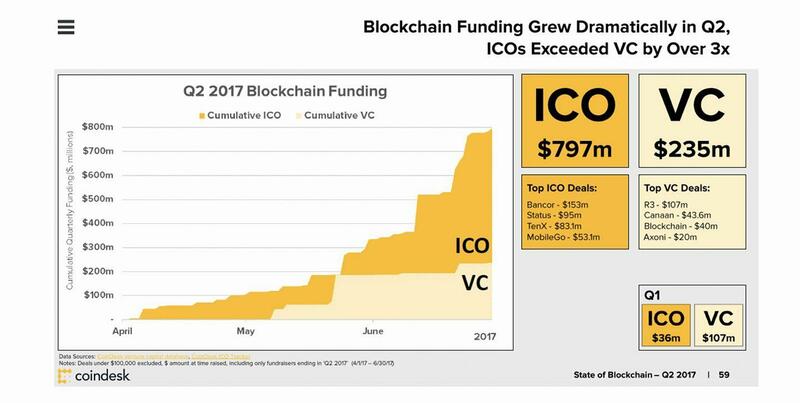 There is no doubt that ICOs have changes the financial landscape over the past 2 years. In the first half of 2017 alone they raised over $1 billion! However, all these insane success stories tend to make us look at facts with rose-tinted glasses. 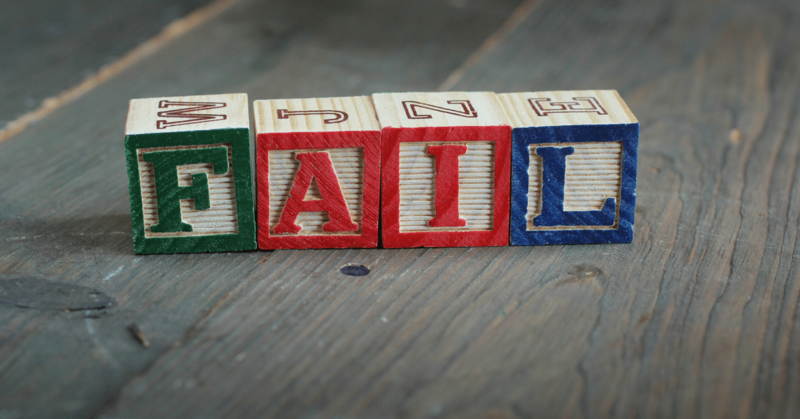 The fact is, that around 99% of all ICOs out there will fail. And that’s not exaggerated doom and gloom, over the last few years, thousands of cryptocurrencies have been created and over 90% of them have failed. And the fact also remains that given the insane success of most ICO’s, scammers are flooding the market creating bogus dapps/coins to get their fill of the ICO pie and effectively create an “ICO bubble”. Tokens are basically native currencies that can be used in an environment (think of the arcade coins that you needed to play games in an arcade) or they give their owners various rights inside the native environment (Think of the wristbands that certain nightclubs use which entitles you to get a certain number of free drinks). The transaction is a pretty simple one. 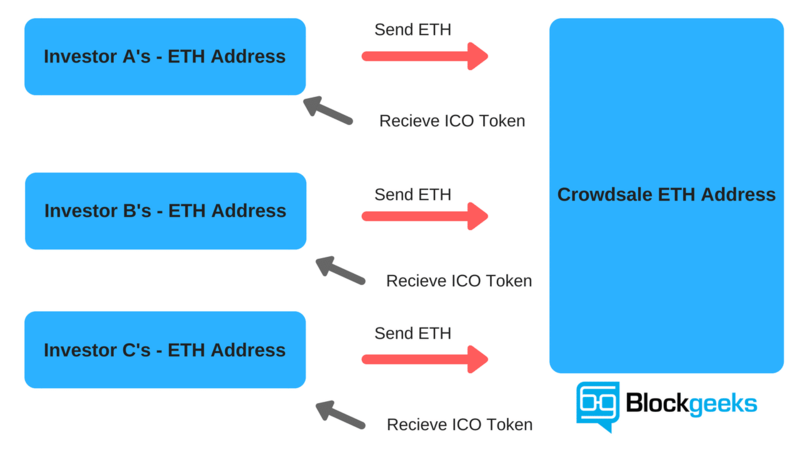 If someone wants to buy the tokens they send a particular amount of ether to the crowd-sale address. When the contract acknowledges that this transaction is done, they receive their corresponding amount of tokens. It is funny how most developers forget the “cryptoeconomics” of their ICOs. There are two words that makeup cryptoeconomics: “cryptography” and “economics”. While most developers pay attention to the cryptography part, they hardly pay any attention to the “economics” part. As a result of which, it is very rare to find a token whose economic skeleton has been properly and thoroughly mapped out. In order for the token to be decently valuable in the long run, there must be sufficient demand for it but that is not what is usually seen in the ICOs. What is seen is unsustainable token inflation which largely happens because of flawed economic models and the greater fool theory (more on that in a bit). For these permanently inflationary tokens, their demand must always outpace their inflation for them to be valuable in the long run, which more often than not creates a Ponzi Scheme like scenario. Before we go into all that, however, we need to understand where the fundamental problem of most ICO economic model lies. One of the biggest advantages of ICOs is that anyone can come and raise money for their concept…not a finished product, a concept. There is still a long way to go before that concept can become a product and as with anything, there is a 90-95% chance that it will be a failure. These are people who have little to no idea about how the blockchain works, they are just putting in money to make a quick buck. Seeing this trend, the developers shifted their focus. Instead of making Dapps/currencies which added something new and unique to the ecosystem, they started making products for the ICO. Their end goal became: “Build a flashy enough whitepaper to get good money in ICOs”. Because of this rampant speculation and very little due diligence, the “Greater Fool Theory” came into play. The Greater Fool Theory is an economic theory which states that the price of an object increases not because of the value that it brings in but because of the irrational beliefs attached to it. Art is a great example of the greater fool theory. So let’s apply the same to ICOs. You have a bunch of dapps and currencies coming up which are bringing in nothing new to the ecosystem. However, because they have been hyped up so much and there so many ignorant investors around, their value increases anyway, and as a result, the tokens face an inflation. Investors are investing millions into concepts that don’t even have an alpha version of their product. Investors are desperate to put their money in because they think that ICOs are a way to get rich quick. In order to cash in on this, developers are creating products more aimed towards ICOs than to give actual value. 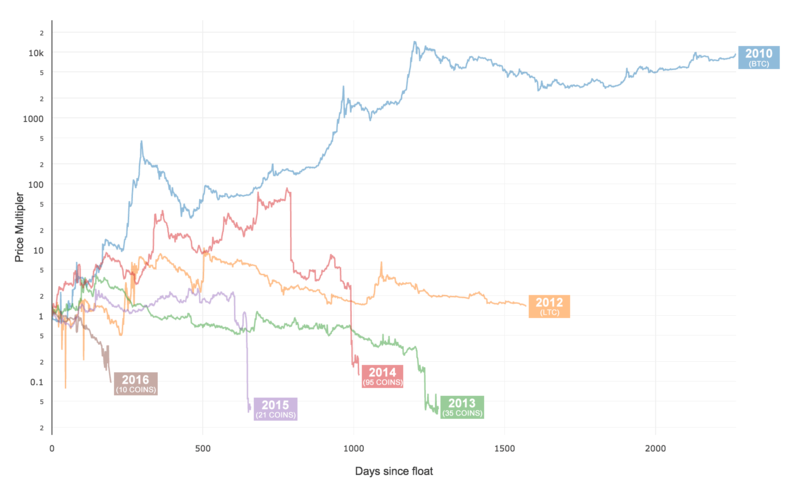 Because of the “Greater Fool Theory.” the value of the tokens gets inflated. If this sounds suspiciously like a bubble then yes, you are right and the thing is, we have been here before, we have seen this play out. The whole ICO situation is scarily reminiscent of another wave that swept us in the late 90’s. They say that those who are not aware of history are bound to repeat it. So let’s do a quick history lesson and turn back the clocks. Around 1997, the internet became big and tech companies began to emerge everywhere. Investors started putting in their money and flipping their investments into huge sums. Eventually, everyone who saw this started getting major FOMO (fear of missing out) and they began giving away their money to companies without even having any idea as to whether the business had the potential to work or not. He hit the nail right on the head, most of the companies that got millions from their investors failed and some turned out to be nothing more than scams. Eventually, the bubble burst in 2002. Companies crashed and lost millions within a year. One of the most infamous examples of this is Pets.Com which lost $300 million in just 268 days! The parallels between the ICO bubble and the dot-com bubble are a bit frightening. Much like dot-coms, the ICOs have attracted a lot of investors who don’t want to miss out on the gold rush. Much like the dot-coms ALL the investing is done purely from speculation. You have to realize that most of the companies that you are investing in, in ICOs barely have anything ready. Most of them don’t have the alpha version of their end result, it is all based on speculation and the potential of the project. As with anything, most of these projects will fail to get the end results. The reason why the Ethereum ICO worked so wonderfully was that it had a dedicated and driven team of talented developers who were a day in and day out to make it a success, same with Golem. The parallels are very apparent and it can get real scary thinking about it. But we are not market experts. All we can do is speculate. We don’t know whether we are living in the “ICO bubble” or not, nor do we know whether it is a bubble that is going to pop. What we do know is that unless developers stop with their “get rich quick schemes” and actually pay attention to launching ICOs which bring in true value and has a concrete economical skeleton, then we will be seeing patterns which are depressingly similar. What is the definition of Utility? Utility means the total satisfaction that is received by the consumption of the goods or services. Most of the ICOs do not maximize their token utility. The tokens should be absolutely integral to the ICO and must increase the overall value of your final product. If you are an ICO developer, then ask yourself this question: If you take away your token does your business fall apart? If the answer is no, then you don’t need a token. There are only a few cases that make sense to tokenize. 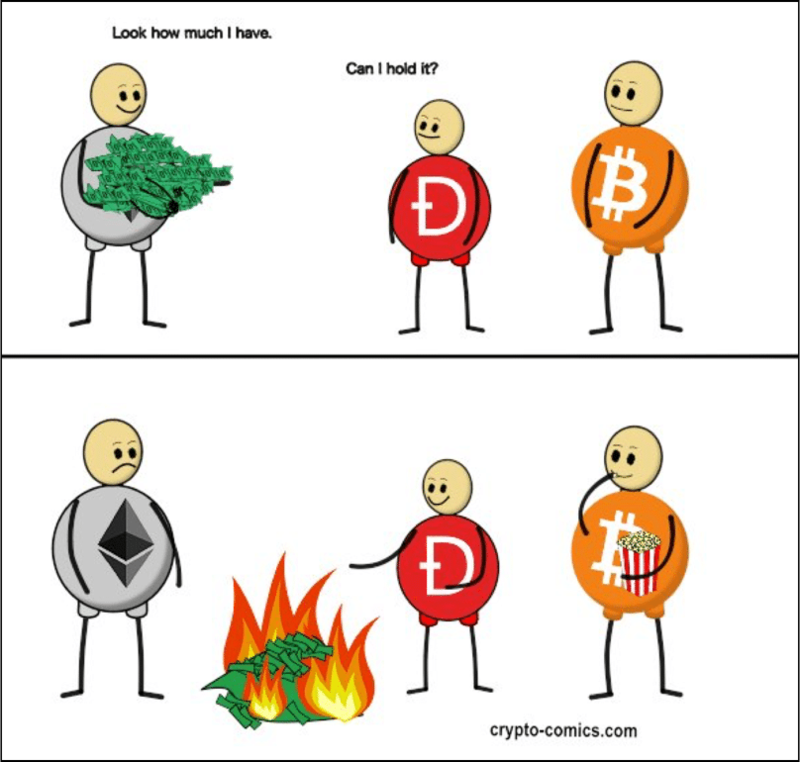 Most people get tokens only so they can “HODL” it and buy more bitcoin and ethereum in the future! Is that all that your tokens are worth? 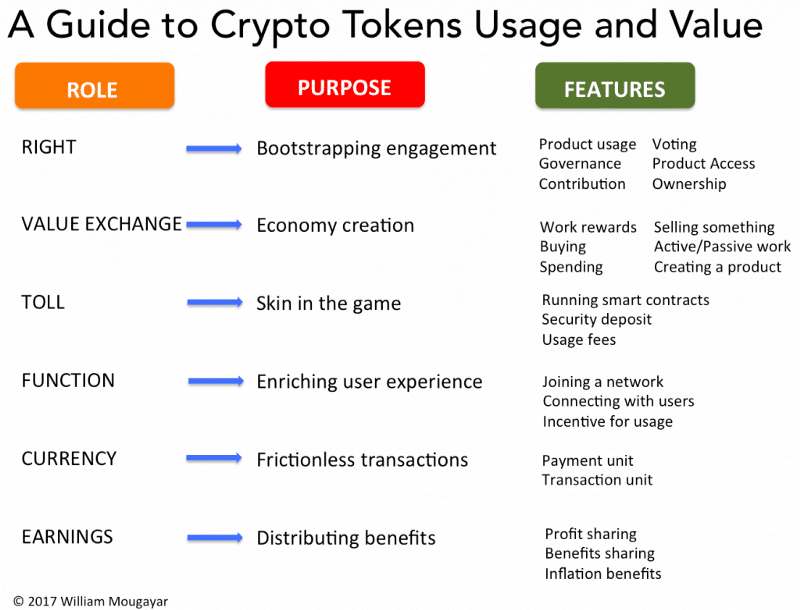 If you do use tokens for your business, then you need to completely understand its role and maximize its utility. 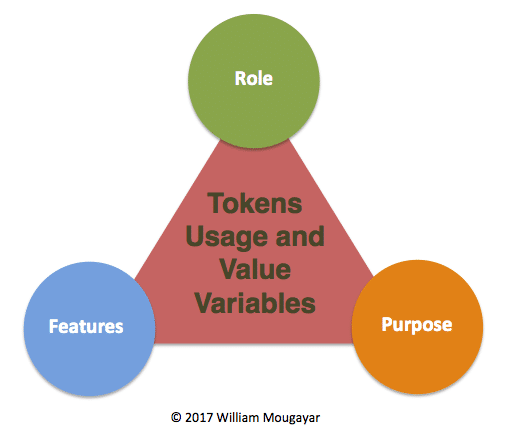 You have to understand that tokens can be multi-purpose tools which can bring in a lot of “oomph” to your business. Your business model should be such that you are exploiting your tokens to the maximum possible limit. Now, let’s move onto another interesting concept called “Token Velocity”. Token velocity in simple terms means: Are people going to hold on to the tokens for long-term gain or sell it off immediately? This is a problem with most ICO and token structures because they are being treated more as a vehicle for liquidation than as a store of long-term value. In fact, regarding this, Willy Woo did an interesting case study. See that red line soaring triumphantly over everyone else? That is bitcoin. It is the only crypto that has performed consistently and grown from strength to strength. 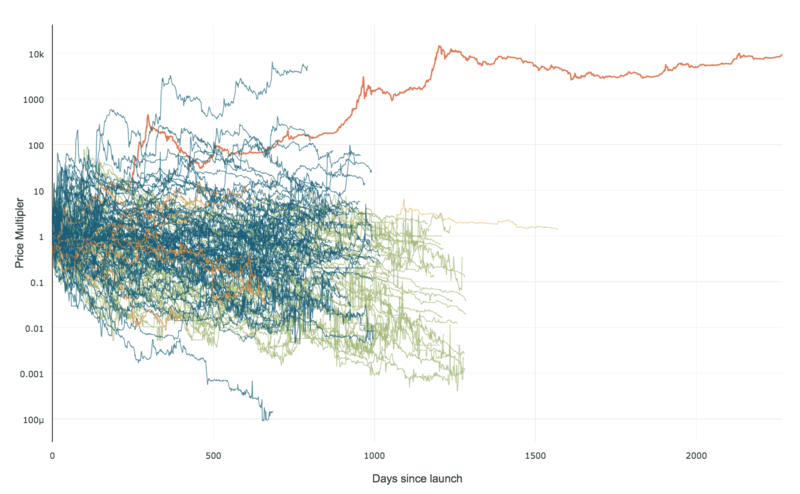 (The blue line above the bitcoin line is a statistical aberration according to Woo). Yikes! That does not look good at all! What this shows is that every year the coins are performing worse and worse. And the reason for that is simple. More and more scam ICOs are coming in and developers are not making valuable enough projects. As a result of which, we have tokens, which perform no other utility than being a means of liquidation and that is exactly why Bitcoin and Ethereum are so far and above everyone else. People realize their potential as a proper long-term store of values. Now if you examine this from the perspective of bitcoin, then you will know exactly why its velocity is less. No other crypto has as much network value as bitcoin. No one wants to trade off bitcoin because they know that there is value in holding it. Does my project really need a token? Am I fully exploiting the token and getting as much token utility as possible. Is my token useful only for initial liquidation purposes? Is there any value in holding my token long term? Is my token ticking off as many roles as possible? In fact, Chainanalysis claims that there is a 1 in 10 chance that you will end up a victim of the theft! That is staggering. Perhaps the most infamous example of this is the DAO attack. The DAO aka the Decentralized Autonomous Organization was a complex smart contract which was going to revolutionize Ethereum forever. It was a decentralized venture capital fund which was going to fund all future DAPPS made in the eco-system. The way it worked was pretty straightforward. If you wanted to have any say in the kind of DAPPS that would get funded, then you would have to buy “DAO Tokens” for a certain amount of Ether. The DAO tokens were indicators that you are now officially part of the DAO system and gave you voting rights. If in case, you and a group of other people were not happy with the DAO then you could split from it by using the “Split Function”. Using this function, you would get back the ether you have invested and, if you so desired, you could even create your own “Child DAO”. In fact, you could split off with multiple DAO token holders and create your own Child DAO and start accepting proposals. There was one condition in the contract, however, after splitting off from the DAO you would have to hold on to your ether for 28 days before you could spend them. And this was where the loophole was created. People saw this in advance and brought it up but the DAO creators assured that this was not going to be a big issue. They couldn’t have been more wrong. Give the user back his/her Ether in exchange of their DAO tokens. This went on and on until $50 million worth of Ether were taken out and stored in a Child DAO and as you would expect, pandemonium went through the entire Ethereum community. The price of Ether dropped from $20 to $13 overnight. This still remains the worst ICO hack ever. The aftermath of the hack was so extreme that it split Ethereum into two different currencies: Ethereum and Ethereum Classic. Here is something truly scary for you to wrap your head around. Phishing scams have stolen up to $225 million in Ethereum related cybercrimes. In fact, as we have mentioned before, more than 30,000 people have fallen prey to ethereum-related cyber crime, losing an average of $7,500 each. So, before we continue, what is phishing? Phishing is the process by which scammers get your sensitive information (like credit card details) by impersonating someone trustworthy and of notable repute. The scammers usually use email and in some cases, they use social media. 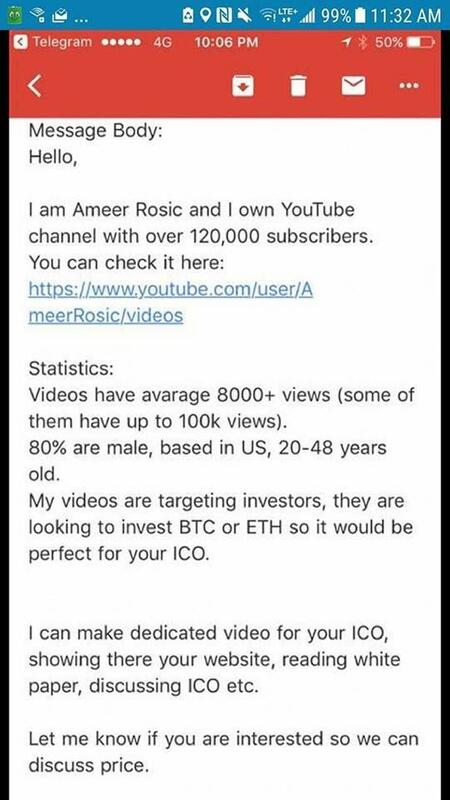 In fact, someone has been trying to phish ICO developers by impersonating our very own Ameer Rosic! As a developer, you need to be very very very careful of this. Imagine giving away your card details or, more importantly, your key details just before your ICO! Obviously, the investors get scammed more than the developers. One of the more popular ways of scamming investors is by creating a fake social media profile which somewhat resembles the real ICO page and then manipulating potential investors to send money to their address. Where are you storing your private keys? How are you protecting your wallets? How are you protecting your customer’s tokens on your ecosystem? Who are you sharing your multi-sig wallet keys with? If you are a developer, then one of the many doubts and fears that you will face from your investors is what is stopping you from running away with all of their funds? Which is a very valid question. The way that you can allay these fears is by using a multi-signature wallet. What is a multi-signature wallet? How does multi-signature wallet save you from human error? Let’s take the example of BitGo, one of the premier multi-sig wallet service providers in the world. They issue 3 private keys. One is held by the company itself, one is held by the user and the third one is a backup that the user can keep for themselves or give to someone trustworthy for safe keeping. To do any sort of transaction in a BitGo wallet you will need at least 2/3 keys to operate. So even if you have a hacker behind you, it will super difficult for them to get their hands on 2 private keys. And on top of that, even if you lose your private key for whatever reason, you still have that backup key that you had given to your friend. Now, how does a multi-signature wallet create a more democratic environment? Imagine that you are working in a company with 10 people and you need 8 approvals in order to make a transaction. Using a software like Electrum you can simply create a custom multi-sig wallet with 10 keys. This way you can make seamless democratic transactions in your company. And that is exactly how you will allay fears regarding the safety of the investor’s money. Suppose you publicly declare that 5 of those keys will be given to neutral parties who are reputable members in the crypto environment that will obviously create more trust among the investors. However, despite all this, even a multi-sig wallet is prone to a hack attack. A wallet is only as secure as the code that makes it. On July 19th, a vulnerability in the Parity Multsig wallet was exploited and hackers made do with $30 million in ether. If you are a developer then, and there is no easy way of saying it, you will most likely fail to create an end product. Does this mean that we hate ICOs? We don’t. Like we said, we really think that it is revolutionary. But, if you are a developer then it is your responsibility to you, your potential investors, and to the future of cryptocurrency itself to use the ICOs as a means of creating something truly meaningful rather a method of making a lot of cash. Why are you doing your ICO? Is your token something that will bring genuine value? Are you sure you are not doing this just to make a quick buck? If you cannot convincingly answer any of these questions then please, do not do your ICO. Don’t contribute to this “bubble”. Make something meaningful. Make something that will add to the environment, not exploit it. Very good read 😉 Thanks a lot!